Emilie and her brother Will are in a spot of trouble. Their house is floating in the ocean and pirates have kidnapped their parents. Emilie must find the strength to be brave and bold like her brother, who, it turns out, has a little bit of experience dealing with pirates. Who knew? To get their Mum and Dad back, Emilie and Will go on an epic journey through time to when dinosaurs roamed, into a wormhole to a warlock’s castle and through a magic doorway to a pirate island. They face man-eating dinosaurs, an igor and his master, zombies, a gang of parrots and a clan of unfriendly pirates led by the notorious Pirate McSnottbeard. It’s a crazy adventure that snowballs with outrageousness, and poor Emilie doesn’t think she has the courage to face all the obstacles that come their way. But courage can be found in the most unlikely of situations, and I love that this story shows kids just how brave they can be. The first in a new series by author Paul Whitfield, Pirate McSnottbeard in the Zombie Apocalypse is a fun and funny story kids will relate to and adore. Written from Emilie’s point of view, the story pulls you in as Emilie shares her fears and worries and gives the reader fun facts about everything she’s learnt about the fantastical creatures from her journey. These include several side notes throughout the story, like Emilie’s lists of ‘things worth knowing’ and definitions from ‘Riskypedia’, the adventurer’s encyclopaedia. And Whitfield’s illustrations are just as fun as his writing style. Helping to break up the text for younger readers, you won’t go more than one or two pages without a fabulous quirky illustration of the brother/sister duo or one of awesome characters in the book. I also loved that the chapters are varied and short. So short, sometimes they’re only one page. I think kids will really appreciate this. It provides bite-sized chunks to read at a time. 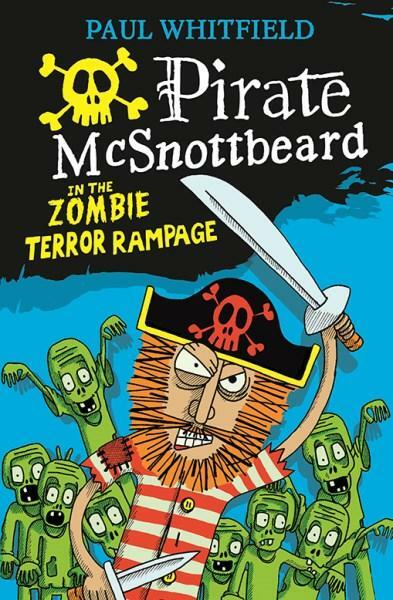 A story about finding courage in the most unlikely of circumstances and learning to become your own hero, Pirate McSnottbeard in the Zombie Apocalypse will be loved by junior adventurers.